The Western always attracted renegades, and with the possible exception of Clint Eastwood, Sam Peckinpah was the genre’s last great American director. Like all great artists, Sam Peckinpah didn’t so much choose his subject as his subject chose him. Quickly going out of fashion by the time Peckinpah got to it, the Western always attracted renegades, and with the possible exception of Clint Eastwood, Peckinpah was the genre’s last great American director, and the last for whom the Western provided a particularly American morality by which the lessons were as painful as the glory was futile. Against the 1960s’ landscape of upheaval and doubt, where the history of the West as it always had been told and accepted was suspect, Peckinpah understood and believed in the Western enough to not altogether buy into it. By the time he made this masterpiece, his only serious competition was an Italian (Sergio Leone) influenced by a Japanese (Akira Kurosawa). 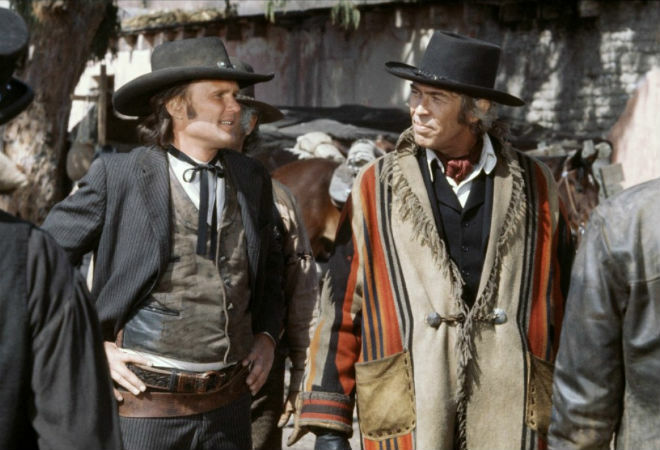 Written by Rudy Wurlitzer, Pat Garrett and Billy the Kid features James Coburn giving his best performance as a former friend turned lawman now hunting down the Kid, played by a startlingly charismatic Kris Kristofferson. Coburn and Kristofferson are surrounded by the veteran likes of Jason Robards, Chill Wills, Jack Elam, and Harry Dean Stanton, not to mention Bob Dylan, who doesn’t so much act as exude mystique, which you may be unsurprised to learn he’s rather good at. When Slim Pickens dies—with Katy Jurado watching helplessly—to one of Dylan’s most stirring songs, “Knockin’ on Heaven’s Door,” it’s shattering. Peckinpah’s best movies were as personal as those of any filmmaker, and so this picture really is about Peckinpah, who feared that in his dealings with Hollywood he was as much traitor Garrett as outlaw Billy; the film freezes on a moment when one of America’s most stalwart values, loyalty, is cut down not just in a hail of bullets but by the ruthless onslaught of an expedient 20th century. It’s the most deeply elegiac film made by a director for whom the whole point of life was elegy, the last best defense against despair.